Ostensibly you're all working together to defend a shared health bar from missiles and occasional enemies, including UFOs and occasional boss monsters. In practice, though, the competitive spirit reigns as players try to earn gold, silver and bronze medals by destroying more missiles than their opponents in each increasingly difficult round.. Cutting off your opponents' angles is key to this competitive sub-game, as is trying to figure out where the best available chain reactions will be. Destroying missiles creates collectible energy power-ups, which can be used to purchase upgraded abilities like quicker missile reloads, faster missiles and larger explosions in the middle of the battle. 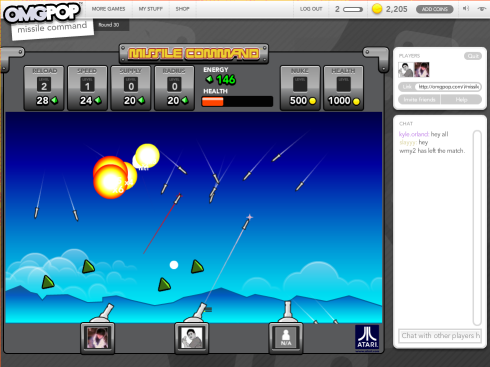 Or you can use OMGPOP coins earned around the site for more health or screen-clearing nuclear explosions. Standard text-based chat options are available as well, although it can be tough to stop and type during the heat of battle. Old-school arcade traditionalists might miss the minimalist aesthetic and solitary, limited-ammo tension of the original game (not to mention the lack of a trackball), but they can sooth themselves by playing the original game over at Atari's site. For everyone else, this new version of the arcade classic provides an interesting, addictive twist on a time-tested formula. Kudos to Atari for bringing one of its classics into the present in such a unique and interesting form.